Ennis Chamber of Commerce has elected Diarmuid McMahon, Managing Director, Sherry FitzGerald McMahon, as president and Gwen Culligan, co-owner County Boutique as vice-president, at our recent AGM. Both will serve a one-year term. Diarmuid succeeds outgoing chamber president William Cahir, of Cahir & Co. Solicitors, whom he congratulated for energising the chamber during his term, which he believes has in turn instilled a positive perception of the work and role of Ennis Chamber amongst businesses in the town. A qualified chartered accountant, Diarmuid is the fourth generation of McMahon’s to manage his family business, which has been trading in Ennis since 1900. He also follows in the footsteps of his father, in the context of Ennis Chamber, with his father Dermot McMahon having served three years in the role of president from 1975. Diarmuid manages a business that is well-regarded for its willingness to innovate. It was the first firm of auctioneers in Ireland to sign up to the Sherry FitzGerald franchise model almost 20 years ago, to become Sherry FitzGerald McMahon. His ambition is to imbue Ennis Chamber with that sense of innovation, during his tenure as president, but also to ensure that the Chamber offers sensible guidance and supports as the town enters a growth phase. He commented, “Ennis has endured a decade of recession and for many businesses recovery is a recent sensation. That said, I am cognisant that some sectors continue to face serious challenges ahead, not least our retail sector. I believe Ennis Chamber can play a strong hand in encouraging and supporting growth of the town. Running a business at the heart of that sector, Diarmuid believes he is well placed to encourage that sector to work together to effect change and deliver a positive outcome for the town. 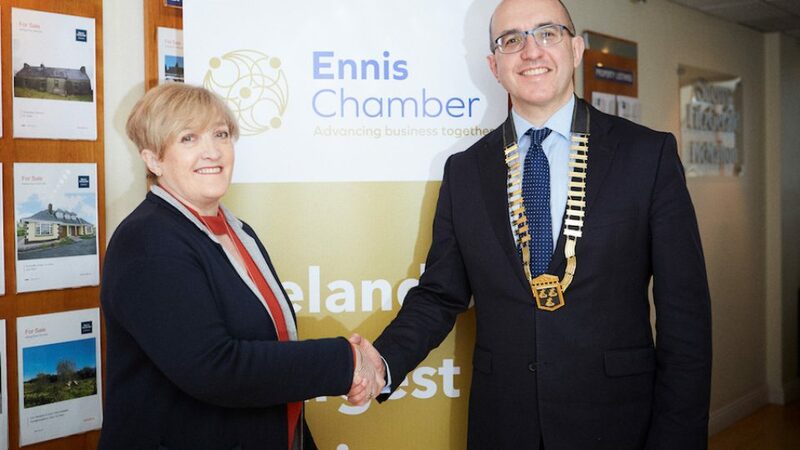 New Ennis Chamber vice president, Gwen Culligan, is already chair of Ennis Chamber’s Retail Committee and while her new role will see her work across all sectors, she is particularly focussed on growing and supporting the retail sector within the Chamber. On the tourism and hospitality front, a sector that is critical to the development and vibrancy of the town, Ennis Chamber as co-promoter, with Ennis Municipal District, of Visit Ennis website and digital platforms, looks forward to unveiling a new digital strategy for the town over the coming weeks, to help it compete more effectively for inbound over-night tourists and day-trippers, including shoppers.